Home > Floor Transitions > Mannington Floor Transitions > Mannington XXX800 Imperial Reducer Transition - 1/4"
Use as a carpet to tile transition when you have a glue-down carpet. 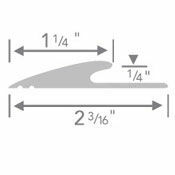 This smooth carpet reducer transitions across a 1 1/4" span and there is a 1/4" undercut. Besides using as a carpet to tile transition piece you can also use this carpet reducer for your other resilient flooring. This carpet to tile transition meets the requirements of the American with Disability Act with its smooth, slip resistance surface. The rubber carpet reducer is a solid 1 piece molded strip which is sold in 12' lengths. The carpet to tile transition section can be cut to length or order as many 12' sections as project requires. No need to buy by the carton. The carpet reducer is available in 7 commonly used color shades; browns, black, blue, and grays. A carpet to tile transition will look complete with the right finishing off piece. A color pallet for the carpet reducer is given at the bottom of this page, however keep in mind each computer screen will show colors slightly differently due to individual screen settings. Contact us if you have a question regarding color. Attach the carpet to tile transition piece with Transition Adhesive. Either choice will give you a secure attachment. Order your carpet reducer today and we will send it direct to your work site, home, or office.